Having a quality set of billiards balls can significantly affect your performance during a match. The way the ball reacts to impact from your cue stick, its bounce, resilience, and ability to transfer energy can completely change the feel of the game. Increased friction can slow game speed while an unevenly weighted ball will result in wild shots that seem to have a mind of their own. The best pool table balls are made of phenolic resin and can dramatically improve accuracy, stability, and power. Billiards balls have come a long way since their commencement by French Nobility back in the 15th century. Ivory, clay, wood, celluloid, bakelite, crystallite, and steel have all been used to make pool table balls at some point in time during the lengthy history of pool tables. Ivory, as one can imagine, was extraordinarily expensive so actions began to be made to lower the price of billiards balls. Celluloid balls became popular in the early 20th century after inventor John Wesley Hyatt developed a new plastic material in 1869. Unfortunately, these sets had a tendency to crack and chip during high impact so a new solution was sought. In modern times, phenolic resin, polyester, and other polymers are currently the material of choice. Even more recently, Krom Premeire released their chrome pool table balls. They’re really cool and you should definitely take a look! Krōm Première Pool Table Balls are the latest thing to hit the market! Learn more. Pool Table balls are made to accommodate unique playing styles and variations of the game. The number of balls in a set, markings, diameter, and weight are all dependent upon the game you’re playing. 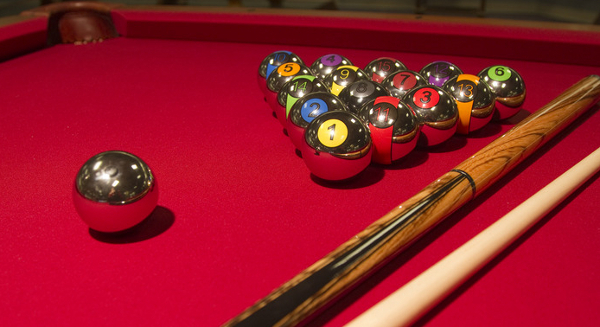 American billiards balls are 2 ½ inches and weigh 5 ½-6 oz. Balls 1-7 are solids while 9-15 are stripes with the 8 ball having a characteristic appearance. Be sure to check out our Pool Table Buyers Guide to learn how to choose a quality table! You’ll want to consider rigidity, roundness, weight distribution, coefficient friction efficiency, and resilience when selecting a quality set of billiards balls. These three factors will influence your game tremendously and you will instantly be able to tell the difference between a high quality set and a cheap imitation. Phenolic resin is a synthetic material that is highly resistant to chemical reactions, moisture, impact, and heat. It is much better than other materials that have been used in the past and is a very reliable choice. 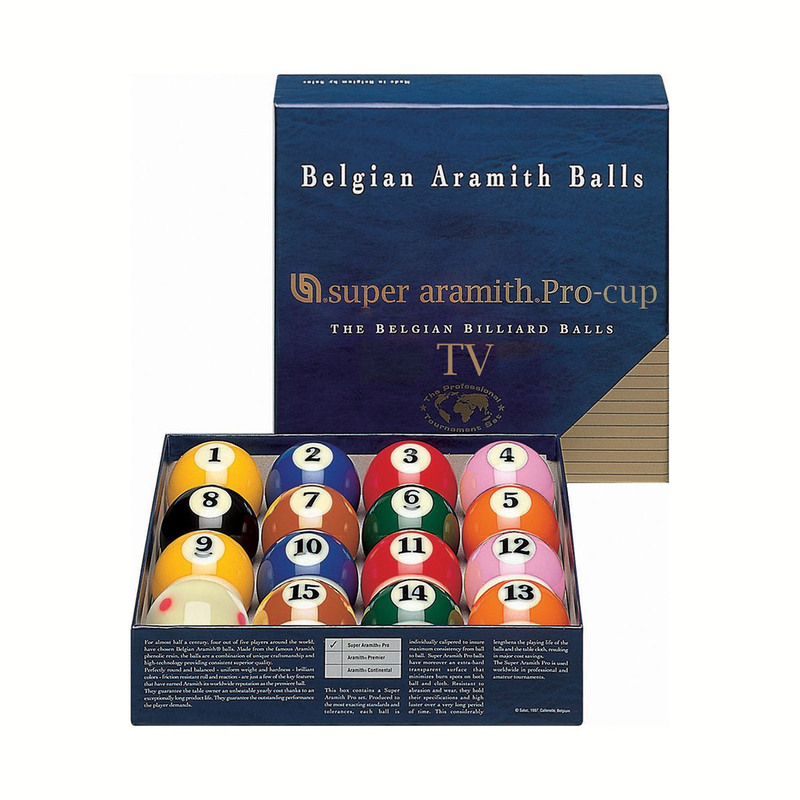 Aramith billiards balls are the gold standard because they are one of the only companies that uses pure phenolic resin. This makes their pool table balls last 5 times longer than other polymer and polyester sets. Other reputable companies include Sterling, Vigma, and Elephant. The 2.25″ Aramith Pro Series TV Pool Ball Set. This is what the Pros use & we’ve got it! Game Tables Online is an online company that retails pool tables, foosball tables, and air-hockey tables to the public. Our team loves playing games all day every day. What better way to earn a living! Find all of your Pool Table Accessories today!